SUP Yoga can provide many benefits in relation to health & fitness. The core muscles are working hard to remain stable while we practice. Balance is challenged and you will build strength as this practice offers a great upper body resistance workout. 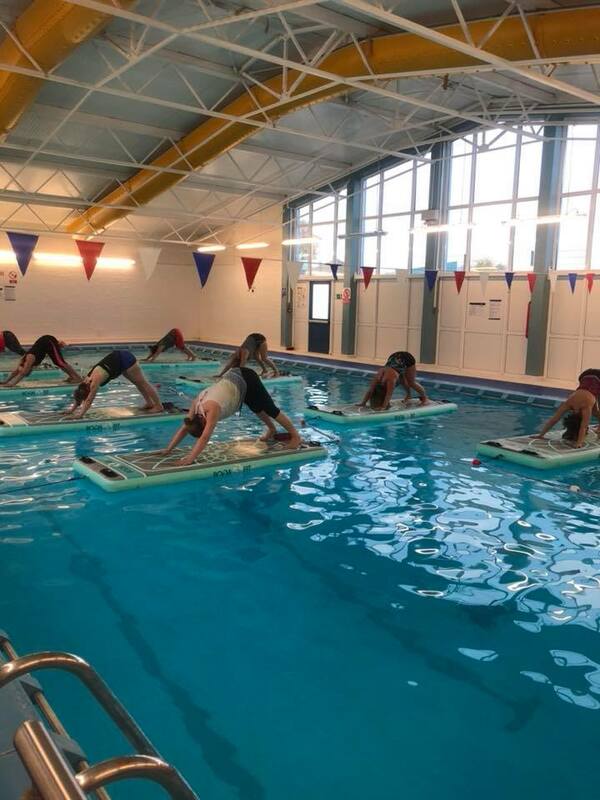 When students first get on a SUP board they tend to feel wobbly and maybe fall in, but soon feel comfortable moving around the board as they improve proprioception - the ability to sense movement within the joints. Check out my Facebook live of the new indoor pool we’ll be using. Save the dates for Sunday 10th February and Sunday 24th March 2019 for our first 2 classes there. Creating a floating yoga studio for year round practice for our 2 hour classes. The pool at Brune Park School is heated to 30 degrees, is 1.05m in the shallow end, 2.6m in the deep end, has changing facilities and plenty of parking. Our BogaYoga FITMats are tethered to pool lane ropes to stop you floating around the pool. Great for those new to SUP or unsure of practicing in open water. The pool is part of the sports complex. The beautiful Hydrotherapy pool at LB Healthcare is one of the largest ozone hydrotherapy pools in the UK. Maintained at 33 degrees Celsius you'll not have to worry about the water being cold if you fall in! The pool is 1.2 metres deep at the shallow end and increases to 1.5 metres at the deep end so great for those not as confident in deeper water. Please check in at reception and use the registration log if you park in the car park. You'll work hard during the practice but you'll be rewarded with a wonderful relaxation, check out the video below. Rachael first trained as a Yoga teacher in 2007 and has been teaching classes since 2012. Growing up and living on the South Coast Rachael has always had a love of the water, especially as her mum is a swimming teacher! Her passion for combining water and Yoga grew when she first tried Stand Up Paddleboarding in March 2014. From that moment she was hooked - so much so that while on her honeymoon in Aruba in 2016 she attended 3 SUP Yoga classes! Rachael trained with SUPFit in May 2017 and started teaching indoor SUP Yoga classes in July 2017. Keep me SUP to date! Thank you for signing up, check out what relaxation on the boards is like.